Yesterday, I described what was known at the time about a mysterious blast near the Parchin military site in Iran. I postulated that satellite imagery would soon be available to help sort out the mystery of what took place. A tweet this afternoon from @dravazed alerted me to this article at the Times of Israel, which, in turn, linked to this story posted at israeldefense.com. 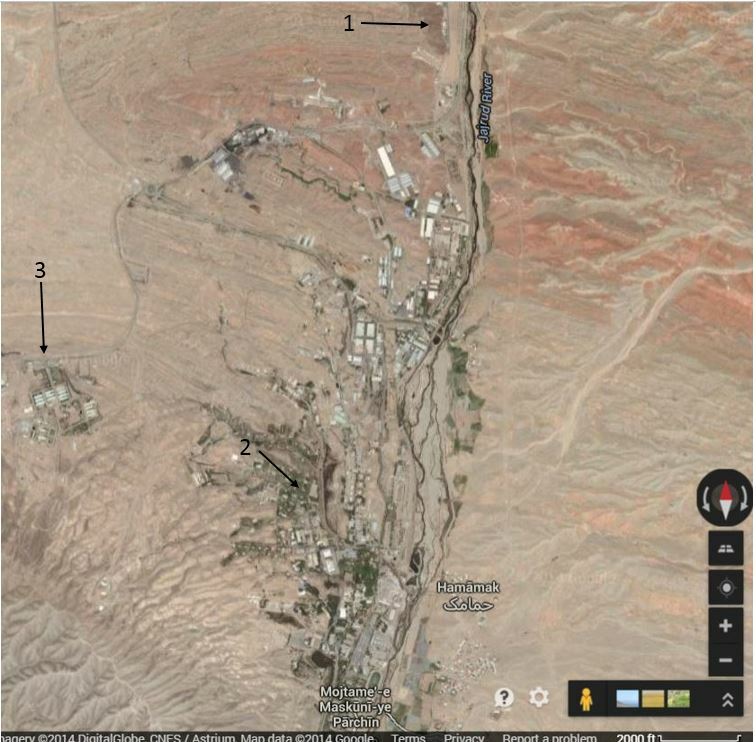 Satellite images obtained by Israel Defense and analyzed by specialist Ronen Solomon clearly show damage consistent with an attack against bunkers in a central locality within the military research complex at the Parchin military compound. Because of the unique shape of the large building adjacent to those destroyed by the blast, I was able to find the location of the blast on Google Maps. Also, with the help of this article from 2012 in The Atlantic, I was able to locate both the area inspected by IAEA in 2005 and the site of the disputed blast chamber where it is alleged that research to develop a high explosive fuse for a nuclear weapon has been carried out. None of these three locations, the blast site, the chamber site or the area inspected in 2005, lies within the boundaries marked as Parchin on Google Maps. The blast site looks to be near a populated area of what is marked on Google Maps as Mojtame-e Maskuni-ye Parchin (which appears to translate as Parchin Residential Complex A if I used Google Translate appropriately). In fact, the blast site appears to be just over a mile from an athletic field. On the map below, #1 is the disputed blast chamber location, #2 is the blast site and #3 is the area inspected in 2005. Note that both the blast chamber site and the area inspected in 2005 are more removed from what appear to be the populated areas. I am far from an image analysis expert, but the blast site looks to me to be more like an industrial site than a cache for storing explosives. If a bunker were indeed located here, that would put the local planning in this area on a par with West, Texas. It will be very interesting to see how US officials describe the damage and the site where it occurred. Back on March 7, AP’s Vienna correspondent George Jahn wrote that two diplomats, described as “nuclear experts accredited to the International Atomic Energy Agency” informed him that they had seen satellite imagery showing evidence of Iran trying to clean the disputed Parchin site of presumed radioactive contamination arising from work to develop a neutron trigger for a nuclear weapon. Writing yesterday for IPS News, Gareth Porter debunked Jahn’s claims. Porter’s conclusions are buttressed by the fact that David Albright’s ISIS, which Porter notes has published satellite imagery of the Parchin site since 2004 in its efforts to prove Iran is working on a nuclear weapon, has not published any imagery relating to the “clean-up” claims. Satellite images of an Iranian military facility appear to show trucks and earth-moving vehicles at the site, indicating an attempted cleanup of radioactive traces possibly left by tests of a nuclear-weapon trigger, diplomats told the Associated Press on Wednesday. Two of the diplomats said the crews at the Parchin military site may be trying to erase evidence of tests of a small experimental neutron device used to set off a nuclear explosion. A third diplomat could not confirm that but said any attempt to trigger a so-called neutron initiator could only be in the context of trying to develop nuclear arms. One major problem with taking the tack of accusing Iran of trying to develop a neutron trigger is that until now, the loudest accusations relating to the Parchin site have centered around development of a high-explosives based trigger. See, for example, this post where I discuss claims from Benjamin Netanyahu, David Albright and Joby Warrick that high explosives work was aimed at a trigger rather than production of nanodiamonds. Iran has previously attempted to clean up sites considered suspicious by world powers worried about Tehran’s nuclear ambitions. Iran razed the Lavizan Shian complex in northern Iran before allowing IAEA inspectors to visit the suspected repository of military procured equipment that could be used in a nuclear weapons program. Tehran said the site had been demolished to make way for a park, but inspectors who subsequently came to the site five years ago found traces of uranium enriched to or near the level used in making the core of nuclear warheads.